Recruitment 2016 please see the information given below. 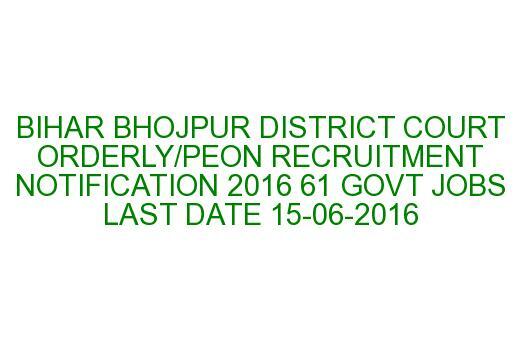 Click here to see the Orderly/Peon notification of Bhojpur District Court Recruitment. undertake strenuous work and must know to ride a bicycle. is 18 to 37 years. to 40 years, and for SC/ST male and female 18 to 42 years. will be based on Personal Interview only. Salary is Rs. 5200 – 20200 with grade pay – 1650.
each cover to be enclosed with the application. educational qualifications, employment registered copy. through registered post only on or before 15-06-2016 04:00PM. details please see the official notification..
Click here to download the application form for the recruitment of Bhojpur District Court Orderly/Peon Recruitment 2016.
article to your lovable friends through online via social networking sites.